Which Patient should get Acute Cath Lab Activation in MI? Who needs an emergency PCI? Activate the Lab for unambiguous STEMI (only clear STEMIs have a 90 minute CMS mandate). Get Cardiology or Interventional Consultation for more complicated cases: difficult ECGs, subtle ST elevation, ST depression with ongoing symptoms, STEMI “Equivalents”. This requires a systematic approach, with buy-in from Cardiology that they will respond immediately to such requests for help. What do they get out of it? Fewer false positive activations and more activations for the subtle cases that need it. Proviso: Many non-interventional cardiologists do not understand these subtle ECG findings or pseudo-STEMI patterns. You must be a strong advocate! If you are worried, get serial ECGs, compare with an old ECG, and get a high quality contrast echocardiogram exam. Persistent occlusion of a significant epicardial coronary artery will nearly always have a wall motion abnormality if the echo quality is good, is done with contrast, and is read by an expert. These criteria are only 45% sensitive for MI as measured by CK-MB, and about 70% sensitive for acute coronary occlusion, with perhaps 85% specificity. Beware of early repolarization, LVH, and LV aneurysm as false positives. Beware of subtle ST elevation as false negatives. Other less specific but more sensitive criteria require “new” ST elevation. 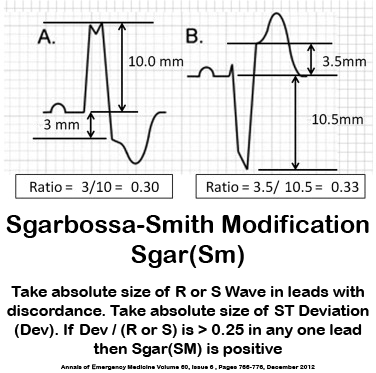 They have Smith-Modified Sgarbossa criteria [cite source='pubmed']22939607[/cite] Any single lead with at least 1 mm of discordant ST elevation that is >= 25% of the preceding S-wave. This does not apply to extreme tachycardia, pulmonary edema, hypertension, as they may have falsely elevated ST segment, although such ill patients should have a low threshold for cath lab activation anyway. Stabilize patient before assessing the ECG, if possible. New RBBB + LAFB is a very bad sign. It is highly associated with proximal LAD occlusion and bad outcomes. See this paper by Widimsky et al.1, which shows the high association of RBBB, especially with LAFB, with LAD occlusion. Furthermore, among 35 patients with acute left main coronary artery occlusion, 9 presented with RBBB (mostly with fasicular block) on the admission ECG. If there is STEMI, there will be pathological ST elevation, but it may be downsloping and very difficult to discern, and can only be done with accurate identification of the end of the QRS. In RBBB, the ST segment that comes after a large R'-wave in V1-V3 should have slight ST depression (in other words, the ST segment should be discordant to the R'-wave, similar to discordance in LBBB). RBBB generally has zero ST elevation anywhere, although there are occasional cases in which a small amount is present without pathology. If you see STE in RBBB, you should suspect acute MI. 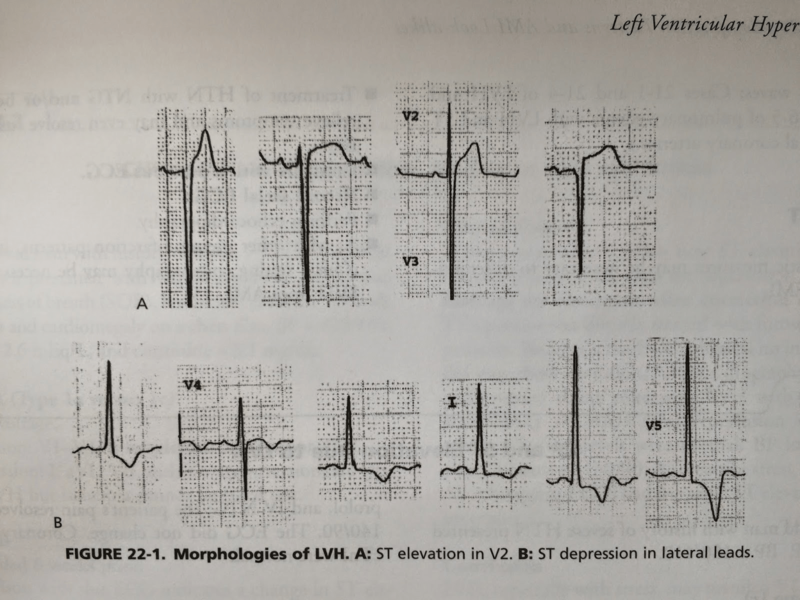 Elevation of any degree in two contiguous leads (II, III, or aVF) with any amount of ST segment depression in aVL is highly suspicious for inferior MI. If there are well developed QS-waves, it is likely to be old MI with persistent ST elevation. LV aneurysm, LVH, WPW, and LBBB all have repolarization abnormalities that produce reciprocal ST depression in aVL. If these are not present, ST depression in aVL is highly sensitive and specific for acute inferior MI. Any ST depression (it might be as little as 0.25 mm, so be careful!) in aVL was extremely sensitive for any coronary occlusion that resulted in inferior infarction. Of 426 inferior MI due to complete coronary occlusion, 418 (98%) had an obvious inferior MI and/or had some ST depression in lead aVL. Even when there was ST elevation in V5 and V6 (35 cases), there was some ST depression in lead aVL in all 35 cases! No pericarditis case had any ST depression in lead aVL (100% specificity, CI 91-100%) . We did not compare inferior early repolarization (as defined as benign inferior ST elevation). Some inferior early repol may have some ST depression in lead aVL, but I believe that this is very uncommon. I have been unable to find a consecutive cohort of proven benign inferior ST elevation to formally study. ST depression in aVL was more accurate than STE in lead III greater than STE in lead II. 88% of inferior STEMI had STE in III greater than II, but 12% did not. Think of RV MI in any inferior MI, especially if it is due to an RCA occlusion (any ST depression in lead I is fairly sensitive and specific for RCA as the infarct artery). If the RCA is the infarct artery, consider RV MI especially if there is hypotension. It often shows as ST elevation in lead V1, and a right-sided ECG with ST elevation in right-sided leads, especially V4R, is diagnostic. Myth: When presenting with Inferior MI – Disproportionate ST segment elevation with greater ST elevation in lead III than in lead II is pathognomonic for an RVMI. This is completely false. This finding is sensitive, but not at all specific and not at all pathognomonic. STE in III greater than II suggests RCA over circumflex (by no means absolute). 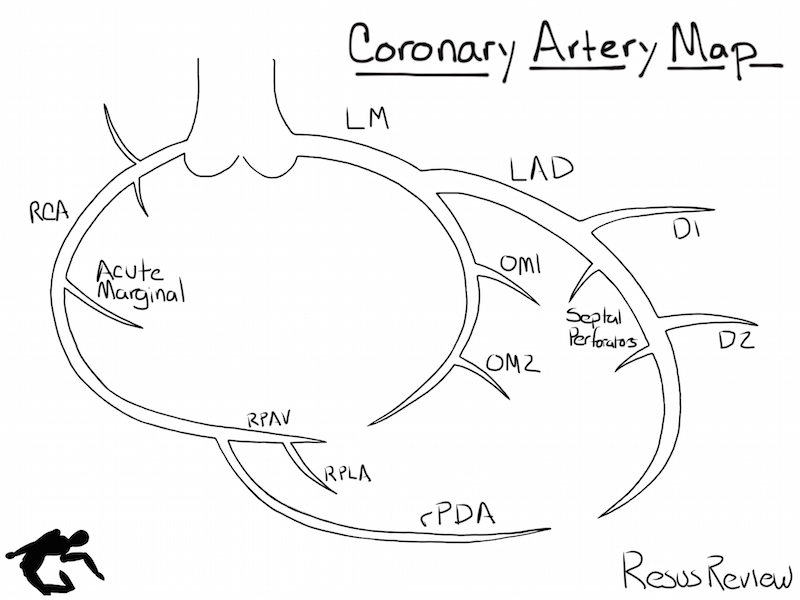 All RV MI come from RCA occlusion, but only from RCA occlusion proximal to the RV marginal branch and ONLY if the RV is not also supplied by the LAD, which it often is. Thus, STE in III > II says nothing about RV MI except that the RCA is involved. Proximal RCA occlusion does not imply RV MI physiology by itself. A minority of proximal RCA occlusions have RV MI physiology. Take home: RV MI usually has ST elevation in V1 UNLESS there is concomitant ST depression in V2 (posterior MI which attenuates the STE in V1). Here there is ST depression maximal in V2-V4, not V5, V6. This is posterior MI until proven otherwise. ST depression in II, III, aVF does NOT signify “inferior ischemia.” It is usually a reciprocal manifestation of ST elevation in aVL, which may be very subtle. High lateral MI is often best seen by the reciprocal ST depression in leads ii, III, aVF. Beware any concordant ST elevation. With LVH, the ST elevation is discordant to the deep S-wave in V1-V3 and the ST depression is discordant to a high voltage R-wave in V5, V6. V4 is variable in positivity. Look for changes from previous ECG. In those leads with problematic ST Elevation, if there is high voltage, then assess the ratio. I think 25% [cite source='pubmed']22738872[/cite] is far too much, too insensitive especially for LAD occlusion. These problematic cases usually have at least one S-wave with a 30 mm amplitude. 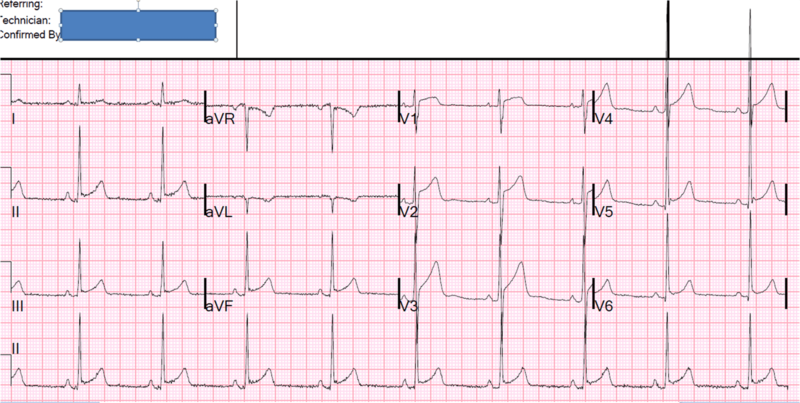 One rarely sees the ST elevation (at the J-point, relative to the PQ jct.) greater than 4 mm, for a ratio of 14%. If Steve must choose a ratio for these leads, he would choose 17%, or 1:6 ratio. Armstrong et al. 's 25% would require 8 mm of STE in such a case! Here are some Morphologies that DR. Wang says are STEMI in LVH, Steve is sure of the 1st and 4th, and pretty sure of the 2nd and 3rd. Sum of the amplitude of the deepest S wave in any lead plus the S wave in lead V4. If the deepest S wave is in V4, then double that value. If the total is greater than 2.3 mV (23 mm) in women and greater than 2.8 mV (28 mm) in men then left ventricular hypertrophy is diagnosed. (Peguero JG et al. Electrocardiographic criteria for the diagnosis of left ventricular Hypertrophy). (1.196 x STE at 60 ms after the J-point in V3 in mm) + (0.059 x computerized QTc) – (0.326 x R-wave Amplitude in V4 in mm). QTc is the computer measurement. RAV4 = R-wave amplitude, in mm, in lead V4. ST elevation (STE) is measured at 60 milliseconds after the J-point, relative to the PR segment, in millimeters. Use the Calculator at Steve's Blog. See applet down right side of blog, or get the free iPHONE app called subtleSTEMI. There are many examples of its use on the blog. Terminal QRS distortion is present in anterior myocardial infarction but absent in early repolarization. To state it a different way, No S and No J points to AMI rather than early repol. Associated with extremely tight acute thrombotic LAD stenosis/subtotal occlusion or occlusion with minimal collateral flow. Hyperkalemia is another common cause of tall T waves. If in doubt, measure the K! Usually indicates left-main or LAD insufficiency (not necessarily occlusion, as so many of us have thought). aVR elevation with ST depressions in a patient whose pain is controlled by medical management and whose ST deviation largely resolves, and is hemodynamically and electrically stable, can be managed medically with extremely vigilant observation, continuous 12-lead ECG monitoring, and next day Cath. The new 2013 ACC/AHA guidelines give this as an indication for thrombolytic therapy. This is the first time they have recognized that the studies prohibiting thrombolytics for ST depression did not include this high risk group. They are differentiated based on the T-wave amplitude (specifically T/QRS ratio), and the principle that an acute MI, in contrast to an old or subacute MI, has large upright T-waves. We have both derived and validated this rule. Suspect it when there are QS-waves in V2 and V3. If there is one lead of V1-V4 with a ratio of positive T-wave amplitude to total QRS amplitude (T/QRS ratio) that is > 0.36, it is highly likely to be acute MI. If < 0.36, it is highly likely to be LV aneurysm. Subacute MI (chest pain duration > 6 hours) is a possible false negative. Inferior aneurysm is much more difficult to diagnose, as acute inferior MI can have Q-waves that mimic aneurysm. Assume it is acute unless historical or echo data prove otherwise. XIV. What if it looks like a STEMI, but there are Q-waves? Q-waves may appear within the 1st hour of pain onset. If the patient still has chest pain, they should go to the lab. Non-STEMI: Does not need reperfusion until 24-36 hours, right? Wrong! There are Non-STEMIs that need the cath lab now. The dichotomy is false. Patients with objective evidence of ischemia (high risk like h/o CAD with typical pain, or ischemic ECG, subtle ST elevation, or + trop) and persistent ischemia (usually persistent pain, but also persistent ischemia on the ECG) in spite of maximal medical therapy (antiplatelet, antithrombotic, IV nitro) need to go to the cath lab immediately. Evidence? 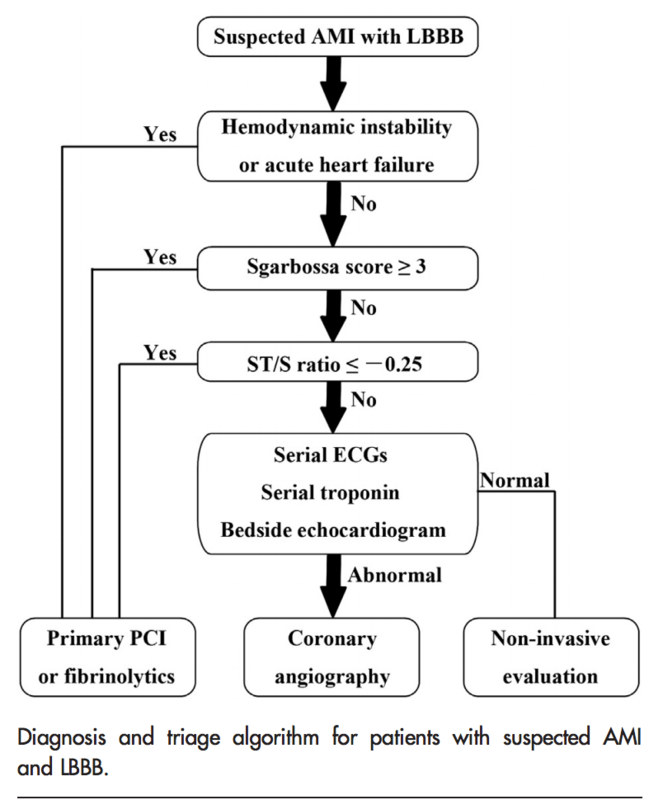 No randomized trials, but there are 5 trials of emergent PCI for Non-STEMI. Few know that all of them either excluded patients with persistent ischemia or showed benefit of emergent PCI. The largest trial by far, the TIMACS trial [cite source='doi']10.1056/nejmoa0807986[/cite], by Mehta et al. — they did not even state in their methods that they excluded patients with refractory ischemia. Steve had to personally contact Dr. Mehta to find that out. Dr. Mehta said, “He cannot imagine that any investigator would have enrolled a patient with refractory ischemia.” Early cath was also average of 14 hours. They did find that for those who were “high risk,” as defined by GRACE score > 140, this so-called “early” cath did result in better outcomes. Also, there are 4 studies on the condition of the infarct artery in patient with “Non-STEMI” who get their cath the next day: they all show that about 25% have an occluded artery at the time of cath 24 hours later, that they have higher biomarkers, worse LV function, and higher mortality than the “Non-STEMI” patients with an open artery. So treatment is simple: Objective evidence of ischemia (including, but not limited to, ST depression and subtle ST elevation), and you can't control it: go to the cath lab. Not every Non-STEMI is alike. Steve’s shop now has an intermediate path other than the typical STEMI or Not a STEMI dichotomy that they call Pathway B. They page the on-call cardiologist for cases that might need emergent PCI, but are not STEMI, and they emergently (within 5 minutes) help the ED doc assess whether there is need for it, especially with emergent formal contrast ultrasound. They are very responsive, and experience has shown so many unexpectedly occluded arteries that they are now very aggressive. This is a high risk LAD lesion that was occluded at the time of the pain but is now open. The lesion may close off at any moment and this may initially be asymptomatic. If emergent cath is not undertaken, maximal antiplatelet and antithrombotic therapy and continuous 12-lead ST segment monitoring is essential to prevent re-occlusion and to detect it if it occurs. Ownbey M. et al. Prevalence and interventional outcomes of patients with resolution of ST-segment elevation between prehospital and in-hospital ECG. Prehosp Emerg Care 18(2);174-9. Apr-Jun 2014. They found 293 total cases of prehospital STEMI, but could only find all the relevant records in 83 cases (28%). ST Resolution (STR) by the time of ED arrival occurred in 18 of 83 cases. There were no differences between STR and non-STR cases in prehospital vital signs or treatments. 95% of patients underwent cardiac catheterization with a mean door-to-needle time of 57 minutes (interquartile range 43-71). Comparing STR and non-STR cases, significant lesions (greater than or equal to 50%) were found in 94 and 97% of patients (p = 0.6), and subtotal or total lesions (greater than or equal to 95%) were found in 63% and 85% (p = 0.1), respectively. Meisel SR, et al. Transient ST-elevation myocardial infarction: clinical course with intense medical therapy and early invasive approach, and comparison with persistent ST-elevation myocardial infarction. Am Heart J 155(5):848. They studied 1244 consecutive STEMI patients. 63 (5%) had Transient STEMI (TSTEMI): Patients with Transient STEMI were treated with intravenous isosorbide dinitrate, aspirin, and clopidogrel, and/or with glycoprotein IIb/IIIa inhibitors. Coronary angiography performed 1.5 days after admission demonstrated no obstructive lesion or single-vessel obstructive disease in 43 patients (70%). PCI was performed in 48 patients (77%), and 8 patients (13%) were referred to surgery. Left ventricular ejection fraction was within normal limits, and peak creatine kinase was mildly elevated. Transient STEMI was associated with less myocardial damage, less extensive coronary artery disease, higher thrombolysis in myocardial infarction flow grade in culprit artery, and better cardiac function. These data suggest that immediate intense medical therapy with an early invasive approach is an appropriate therapy in patients with Transient STEMI. Subtle ST Elevation is STILL BAD! 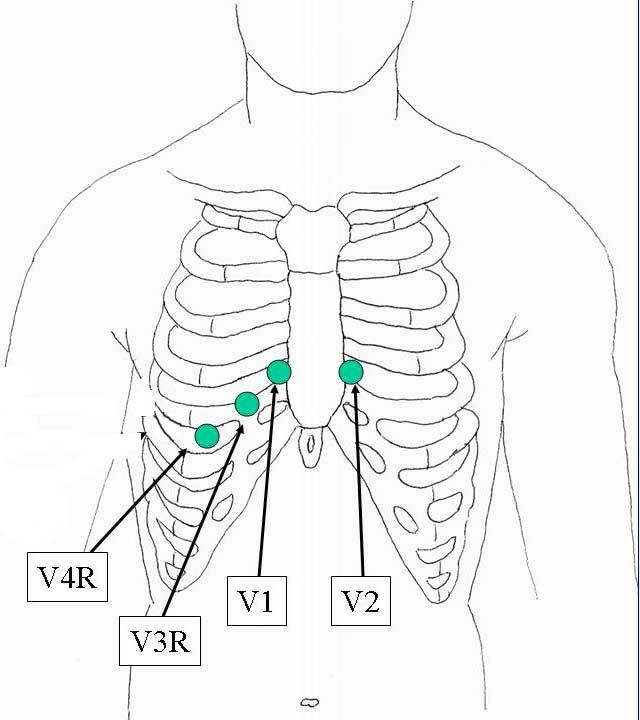 There is no S-wave in V3, and neither is there a J-wave or fishhook. This loss of the S-wave is called terminal QRS distortion, and multiple studies suggest that, with an anterior MI, this predicts a larger infarct, with higher mortality, and even a worse response to fibrinolytics or PCI. Want Steve's Book for Free? Part II of Who Needs an Acute PCI? Scott Weingart. EMCrit Podcast 146 – Who Needs an Acute PCI with Steve Smith (Part I). 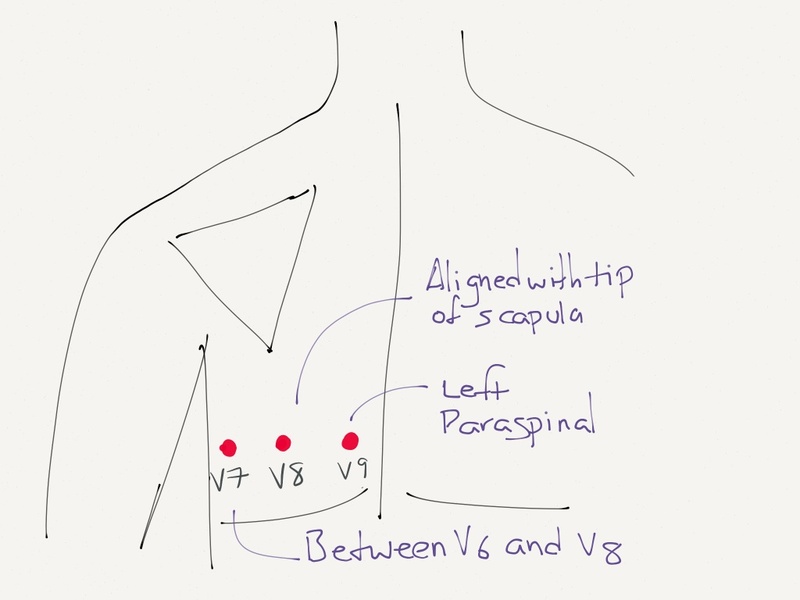 EMCrit Blog. Published on March 29, 2015. Accessed on April 22nd 2019. Available at [https://emcrit.org/emcrit/who-needs-acute-pci/ ]. I have read all of the articles linked and a few more. I know STEMI criteria are relatively poorly sensitive, but where did the 70% sensitivity for ACO come from? One of my favorite presentations. This information and the associated evidence is gold, pure gold for us guys who have to speak with cardiology on a regular basis. I work in a large well staffed cardiac ICU in NC and things flow well. But it is super nice to have this data. This is exactly what I’ve been hoping for! A compilation of electrocardiographic indications for PCI as presented by one of the world’s foremost experts in the field, and hosted by one of the world’s highest quality medical podcasts. As a paramedic, this information is invaluable in helping to identify and initiate the treatment pathway for these patients. Thanks Dr Weingart and Dr Smith. Great podcast, I am eagerly awaiting part II. I wanted your thoughts on a patient I saw last week. A 91 y/o F with an initial complaint of L wrist pain and syncopal episode whose EKG showed sinus brady and new onset LBBB. We called it a new onset simply because we had no prior documentation of one on her. She was admitted under a non-cardiac diagnosis. She began to c/o epigastrium and L shoulder pain the following morning, and now showed Q waves in V1-V4, and a biphasic T wave in V1-V3 that were not present the day before. Her cardiac enzymes were elevated–I don’t have the exact numbers in front of me. My question is, without the lab results, would you have suspected an MI simply based on her EKG changes? 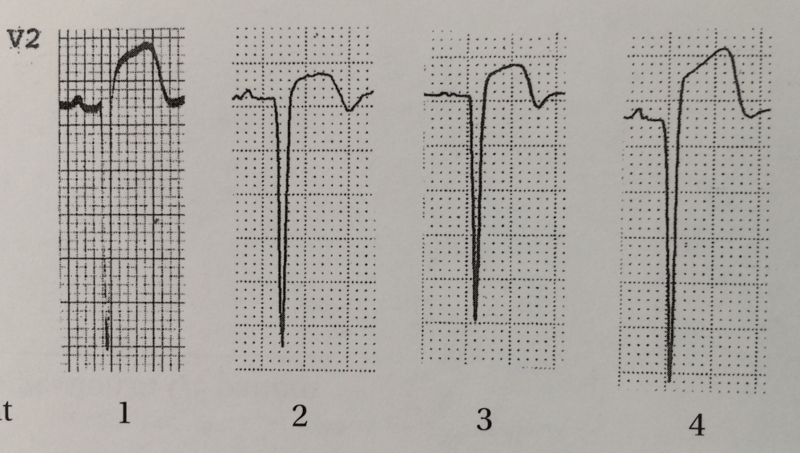 As you illustrated, the trouble with “new-onset” LBBB is that “new” bit: new to you? new to them? just how new is new? Without primary changes, chest pain/anginal equivalent, or gross instability on initial presentation, AMI falls lower on the list; I think you can be more comfortable with that when the LBBB you’re looking at is ‘uncomplicated’ (normal abnormal). The changes on hospital day one could call the decisions on day zero into the retrospectoscope, but unless there were obvious changes missed it seems unlikely you should have made a different decision. I do agree. But my question was, with the second day EKG findings alone, would the suspicion of an AMI be questioned sooner? wow thanks for this info. i have been trying to find the book on out of print book sites since you first mentioned it and they usually want 240 dollars or more. so this is a real treat. one problem is that i tried to upload the pdf of the talk (not book) to evernote but it says it is protected data and is restricted. not sure what that means, Don. Had no problem downloading the pdf and then dragging it into evernote. Great podcast! When will part II be available? In V. Right Ventricular Infarction, how could we tell (based on the EKG) if one might have an actual new LAD occlusion on top of prior inferior wall MI instead of pseudoanteroseptal MI? Great episode. I was just with Steve Smith at a Stabilization Conference at Hennepin County. There was another speaker there named Jim Miner, who I believe you know of as well, who gave a talk about procedural sedation that I think you might find interesting. The part of the lecture on pain control in the critically ill patient was especially interesting and quite different from my understanding of your last talk on this subject. I think an interview or debate between the two of you would be great. His general point was that the data show that aggressive pain control of acute pain in the acutely critically ill patient leads to worse outcomes. He stated that some sedation and amnesia are needed but he thinks aggressive pain control in these patients may be overrated. That is my interpretation of his talk and he is much more knowledgable on the subject as you are. I think if the two of you were to talk about this we will all learn a lot!